This bingo set can be used for either review or assessment. It is designed to be used in conjunction with the Greek and Latin Prefixes and Example Words: Reference Cards and Card Sort materials, which covers all of the 36 prefixes used in the game. 1. Print and cut out the bingo game cards and calling cards before use. Laminate if desired. 2. Gather marker chips for game play –plastic discs, Cheerios, dry kidney beans, or M&Ms will work. 3. Pass game cards and marker chips out to players. Note the free space in the middle of each card, which can be marked immediately. 4. Decide which type of bingo game will be played – such as 5-in-a-row or blackout, and announce that to the players. 5. 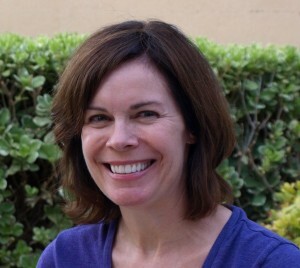 Identify a caller and give that person the calling cards and answer key. After each clue is called, that card can be placed on the answer key to track which have been used. 6. 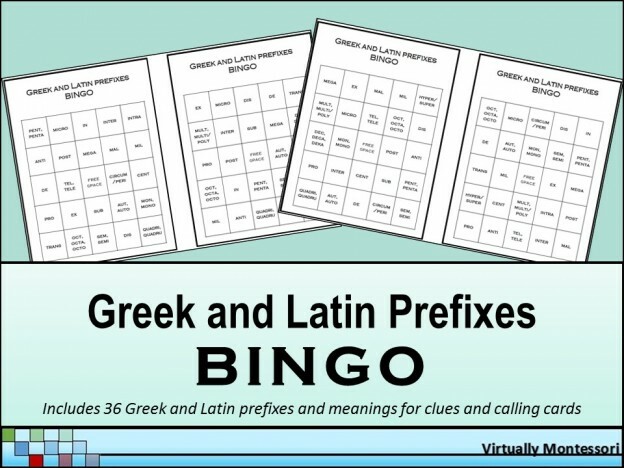 The caller chooses a calling card and reads the clue out loud (for example, “ten” – the clues are definitions of the Greek and Latin prefixes listed above). 7. Players recall which root matches the clue that has been called (ex: “ten” is the meaning of the prefix “dec/deca/deka”), and mark that root with a marker chip if it’s on the players’ boards. 9. The caller confirms that all of the player’s marked prefixes have been called. If they haven’t, continue game play. 10. If a player does have bingo, the game may continue, if desired, until another player gets bingo.